Crown Publishing Group (NY), 9780307951496, 348pp. William Shakespeare's plays are among the great bedrocks of Western civilization andcontainthe finest writing of the past 450 years. Many of the best novels, plays, poetry, and films in the English language produced since Shakespeare's death in 1616 from Jane Austen to"The Godfather" are heavily influenced by Shakespeare's stories, characters, language, and themes. In a sense, his works are a kind of Bible for the modern world, bringing us together intellectuallyand spiritually.Hamlet, Juliet, Macbeth, Ophelia, anda vast array of other singular Shakespearean characters have become thearchetypes of our consciousness. To know some Shakespeare provides a head start in life. In"How to Teach Your Children Shakespeare, "acclaimed playwright Ken Ludwig provides the tools you need to instill an understanding, and a love, of Shakespeare's works in your children, and to have fun together along the way. Ken Ludwig devised his methods while teaching his own children, and his approach isfriendlyand easy to master.Beginning with memorizing short specific passages from Shakespeare's plays, this method then instillschildren with cultural references they will utilize for years to come. Ludwig's approach includes understanding of the time period and implications of Shakespeare's diction as well as the invaluable lessons behind hiswords and stories.Colorfully incorporating the history of Shakespearean theater andsociety, "How to Teach Your Children Shakespeare"guides readers on aninformedandadventurousjourney through the world in which the Bard wrote. This book's simple process allows anyone to impartto childrenthe wisdom of plays like"AMidsummer Night's Dream," "Twelfth Night, Macbeth, "and"Romeo and Juliet." And there's fun to be had along the way. 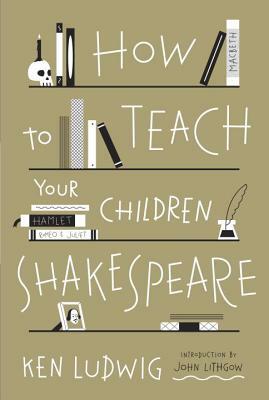 Shakespeare novices and experts, and readers of all ages, will each find something delightfully irresistible in"How to Teach Your Children Shakespeare." KEN LUDWIG is an internationally acclaimed playwright who has had numerous hits on Broadway, in London s West End, and throughout the world. He has won two Laurence Olivier Awards (England s highest theater honor), received three Tony Award nominations, and won two Helen Hayes Awards and the Edgar Award. His work has been commissioned by the Royal Shakespeare Company and has been performed in at least thirty countries in over twenty languages. Some of his Broadway and West End shows include Crazy for You, Lend Me a Tenor, Moon Over Buffalo, Twentieth Century, and adaptations of The Adventures of Tom Sawyer and Treasure Island. He studied music at Harvard with Leonard Bernstein and theater history at Cambridge University in England. Visit him at www.kenludwig.com."